Preheat oven to 425F. Spray a 9 X 13 inch casserole dish with non-stick spray. In a large bowl combine chard, Ricotta, thyme, garlic, zest, salt, pepper and ½ cup Parmesan. Add chicken and stir until well mixed. Cut noodles in half width-wise. Spread 2-3 heaping tablespoons of the cheese mixture across the short end of a lasagna noodle. Roll noodle tightly around filling. Place roll, seam side down, in a casserole dish. Repeat until all the filling has been used. Top rolls with remaining Parmesan. Pour cream over rolls, making sure the cream gets around, and on top of, each roll. Bake uncovered for 18 – 20 minutes, or until golden brown and cream has reduced by half. Remove from the oven and let stand for 10 minutes before serving. Serve with a sprinkling of fresh thyme and extra Parmesan cheese. Tip: Fresh lasagna noodles are available from Italian specialty stores in Winnipeg. 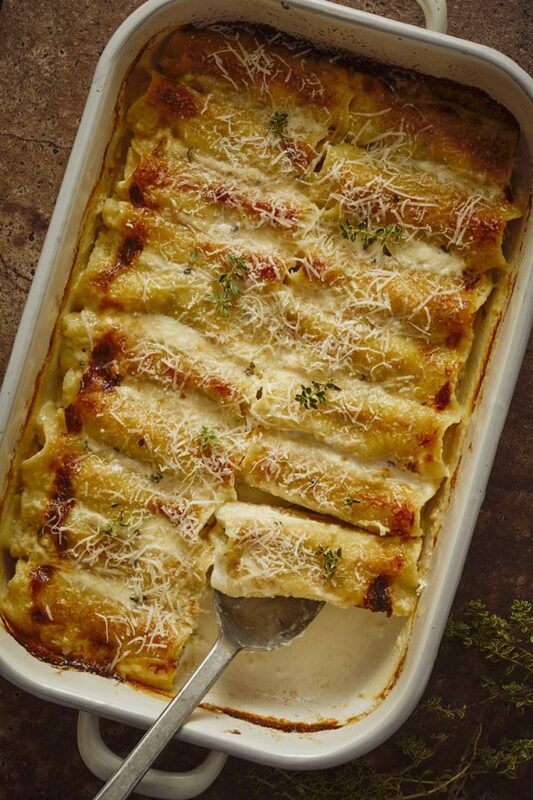 Fresh lasagna sheets (eg Olivieri brand) are available the refrigerated pasta section of most large grocery stores. If you have lasagna sheets, cut the sheets in half to make noodles that are approximately 6-7 inches long.